There are no existing variants. So you want an invisible scar and know that the perfect treatment is the only way to achieve this goal. At the same time, you live an intense, active lifestyle and place great value on maintaining an aesthetically pleasing and smart appearance. For this reason, a noticeable, unpleasant-looking plaster is not an option for you. It is for precisely this reason that the specialists at Scarcare® scar treatment developed the exclusive Scarcare® scar pen. 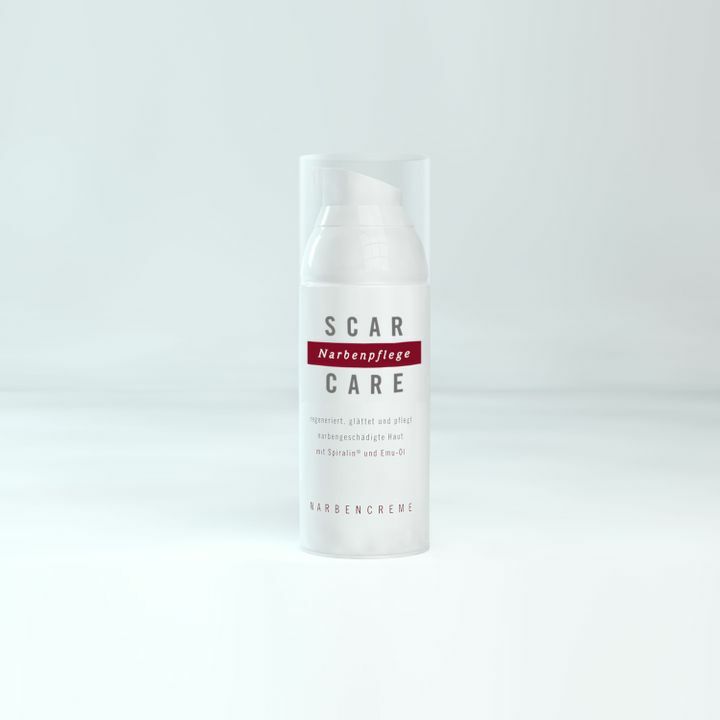 The Scarcare® scar pen is an innovation in the field of scar treatment. It gives your skin invisible care, the whole day long. don't accept any compromises: with the Scarcare® scar pen you no longer have to choose between treatment and beauty. Choose an invisible treatment that fits with your active lifestyle. 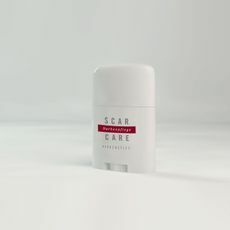 You can take the practical and flexible Scarcare® scar pen with you in your bag or trouser pocket and treat uncovered skin areas throughout the day. Regularly apply the scar pen as soon as your stitches have been removed. 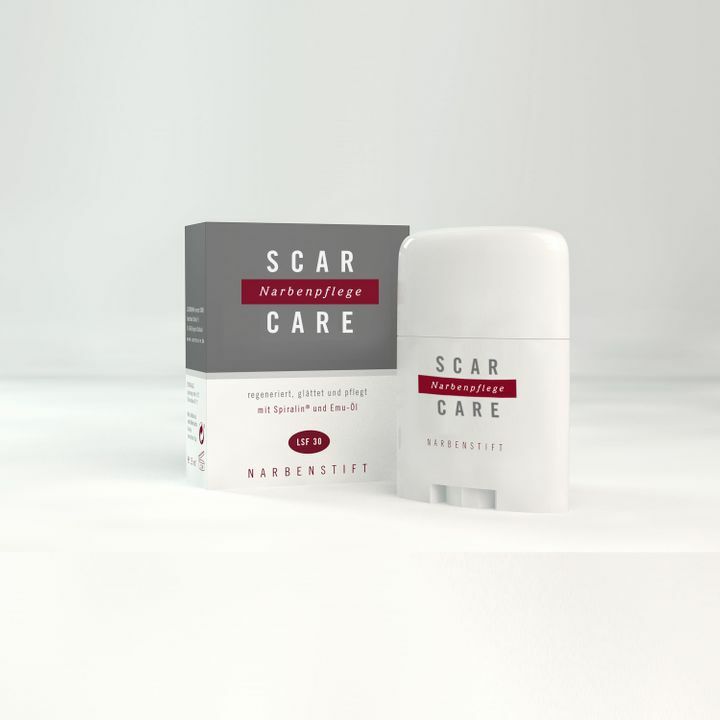 The scar pen replaces the Scarcare® Intensive Patch throughout the day. 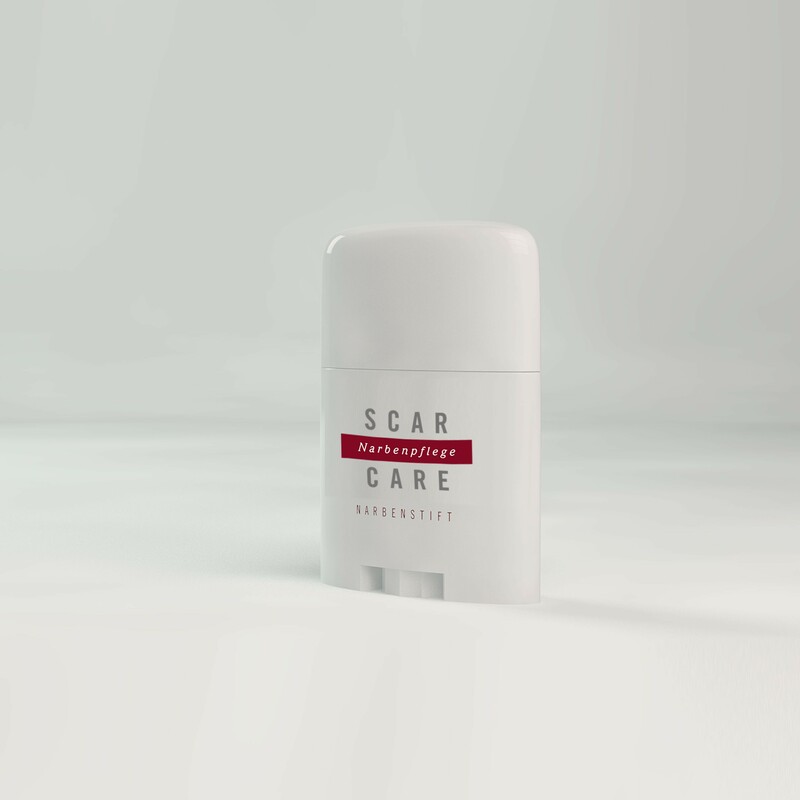 Don't let yourself be slowed down by an operation, or be limited by an unmissable plaster: with the Scarcare® scar pen your can adopt an active and unhindered approach to your day. The Scarcare® scar pen combines the highest standard of care with simple, convenient application, for the active user. Like the obligatory Scarcare® scar cream – the basis for effective scar treatment – the Scarcare® scar pen contains the patented active ingredient Spiralin® and the unique Emu Oil. It has a particularly high level of UV protection (SPF 30). Thus, even scars that have to be exposed to the sun are optimally protected. The Scarcare® scar pen (15 ml) is enough to provide several weeks of treatment. Begin the treatment as soon as your stitches are removed. 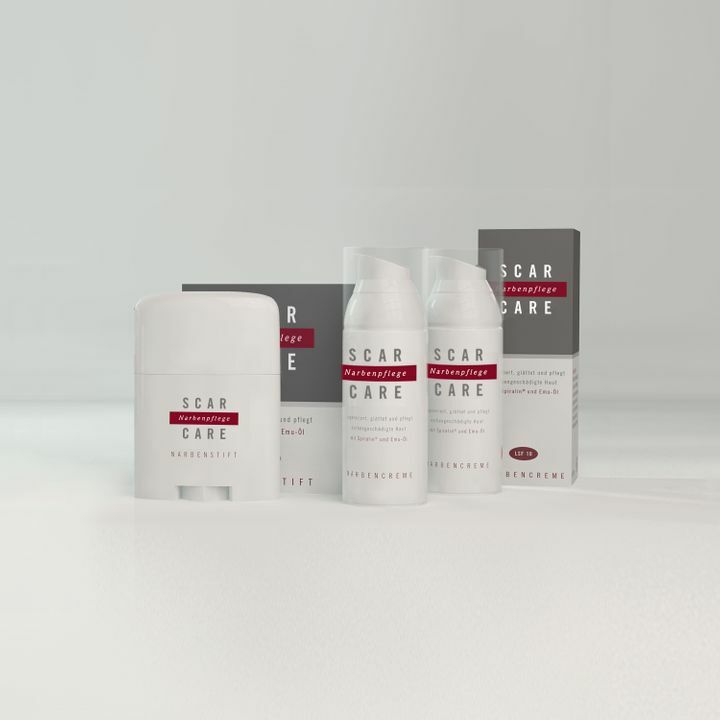 The scar experts at Scarcare® recommend using the scar pen throughout the day and the Scarcare® Intensive Patch at night. Hallo, Ich habe mir ein Narbenpflege-Set für eine große Narbe am Hals bestellt. Bin auch mit der Creme und dem Stift zufrieden. Ich habe den Stift für meine Tochter, die eine Narbe am Bein hat. Funktioniert einfach super. Cremes sind zu fettig und Pflaster mag Sie nicht. Daher ist dies die optimale Lösung! Ich habe eine Narbe an der Stirn von einem Zusammenstoß. Der Nadin Stift ist genau für solche Narren gemacht und funktioniert bei mir sehr gut. Die Narbe ist zwar noch etwas dunkler als die normale Haut, wird aber von Tag zu Tag besser. Der Stift ist angenehm aufzutragen, riecht ganz gut und ich habe ihn täglich bei mir wie beschrieben. Ich habe mich zwar nur beim Sport am Unterschenkel geratscht, hatte aber ne eher grosse Reißwunde. Ich laufe gerne in kurzen Hosen, daher dachte ich, eine professionelle Narbenpflege kann nicht schaden. Der Stift ist optimal. Habe den inzwischen auch für andere Wunden genommen. Einfach cool: heilt alles sehr schnell und ohne Narben. Der Stift ist gedacht für Narben an Stellen, wo man das Pflaster nicht tragen will so der Hersteller. Perfekte Lösung aus meiner Sicht, da sogar die Sonnencreme-Funktion integriert ist. Habe ich nach langem Suchen nirgendwo sonst gefunden. Bin sehr zufrieden auch mit der raschen Lieferung. Alles voll zufriedenstellend. © 2019 Jugendwahn Concepts GmbH. All rights reserved.